As a rule i tend to avoid books that touch on the troubles in Ireland, too close to home, and a bit modern. But this book was always much more than that, it may start in Ireland and the Irish element but its the Boer War that is the core of this book, and the Boer war is something that interests me. A war that is on the cusp on the changes from cavalry warfare to something more mechanised, smokeless gunpoweder, magazine fed rifles and SLR rifles, providing a war where the death toll starts to go to sickening levels. One misconception that has long been in my head as a British invention (the concentration camp), turns out to be a Spanish / American contribution to the modern world (proving you can always learn something new), the american version from the civil war being labeled POW camps, but were in effect the same thing, Spain having the first true “Reconcentrado” (concentration camp) to control the Cuban people. Its these and the more powerful guns and rifles, coupled with the “Kommando” tactics of the Boer that start to change the face of modern warfare and provide a powerful backdrop for the author. Into this maelstrom a young boy is cast, running from his home and past, trying to find his place in the world and understand himself, followed closely by his father Joseph Radcliffe and comrade Benjamin Pierce. Its this relationship that brings the world alive. Both ex-military men from the american wars, both men forged by the fire of battle and the horror of war, men closer than brothers and yet to others who would see them, a white man with his black servant? friend? the label would depend on where they are for the presumption of the role. Introducing the dynamic to this period in South Africa you have the Boer who see them as little more than beasts of burden, chattel to be used. The British, who should be so much more enlightened, can only see a black as a local and again a tool to be used, not a person. While the story progresses with action, and daring on the part of our two heroes, we also see a damning view of how recently we were all so unenlightened, even after so long running an empire spanning many nations, races and colours, the British class system still in place but starting to chow some cracks, and the corruption and rigidity that ran the empire. David Gilmans writing is as always powerful and sympathetic to the subject, feeling the comradeship of the men, the horror of the death doled out in war, and yet the respect and enmity even hate that can been created for an enemy. This being a war against a militia rather than an organised (traditional) army the feelings expressed by soldiers on both sides can be very polarised. all of this captured in such a timeless tale of father and son coming to terms with each other, family history, father protecting son etc.. 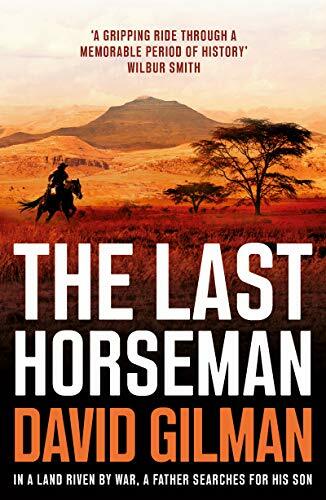 This is a book i highly recommend, for the stand alone story, for the sympathetic way its told, and for the simply excellent writing that drags you from rain soaked Ireland to the dusty plains of South Africa, making you experience every step and emotion along the way.